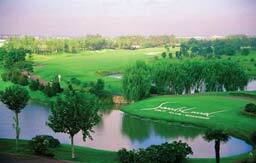 Situated on the River Mao, Shanghai SunIsland International Club provides a variety of amenities, including a 27-hole championship golf course, clubhouse, conference center, sauna, swimming pool, and restaurant. The resort also offers tennis, horseback riding, and other activities to fill your days. An on-site cocktail lounge and live entertainment are sure to make nights enjoyable. All units have air conditioning and cooking facilities. The excitement of the city of Shanghai lies about 55 kilometers west.